Welcome to week 2 of Earth Analytics! In week 02 you will learn how to work with data in R and RStudio. We will also learn how to work with time series data. To work with time series data you need to know how to deal with date and time fields and missing data. It is also helpful to know how to subset the data by date. The data that you use this week is collected by US Agency managed sensor networks. We will use the USGS stream gage network data and NOAA / National Weather Service precipitation data. All of the data you work with were collected in Boulder, Colorado around the time of the 2013 floods. Before you begin this lesson, be sure that you’ve downloaded the dataset above. You will need to unzip the zip file. When you do this, be sure that your directory looks like the image below: note that all of the data are within the week_02 directory. The data are not nested within another directory. You may have to copy and paste your files into the correct directory to make this look right. It is good practice to learn how to organize your files in a way that makes it easier for your future self to find and work with your data! Install QGIS. Use the install QGIS homework lesson as a guide if needed. Then review all of the homework lessons - they will help you complete the submission below. Add the text that you wrote for the first homework assignment to the top of your report. Then think about where in that text the plots below might fit best to better describe the events that occurred during the 2013 floods. Add the plots described below to your R Markdown file. IMPORTANT Please add a figure caption to each plot that describes the contents of the plot. Add the code to produce the following 4 plots in your R Markdown document, using the homework lessons as a guide to walk you through. Use the pipes syntax that you learned in class to subset and summarize the data as required. 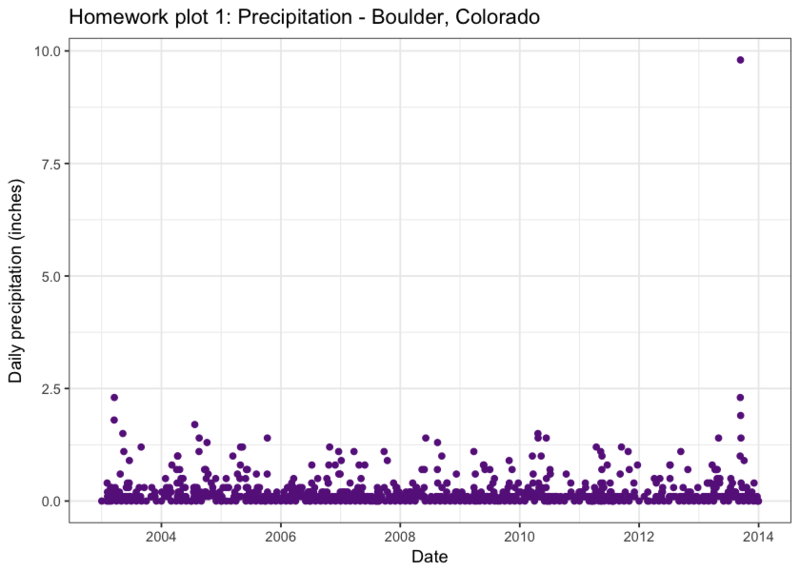 PLOT 1: a plot of precipitation from 2003 to 2013 using the ggplot() function. 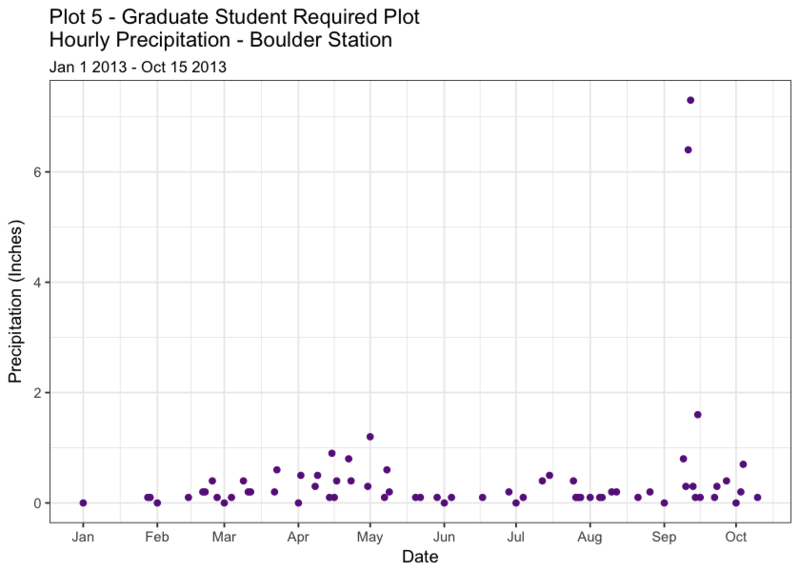 PLOT 2: a plot that shows precipitation SUBSETTED from Aug 15 - Oct 15 2013 using the ggplot() function. 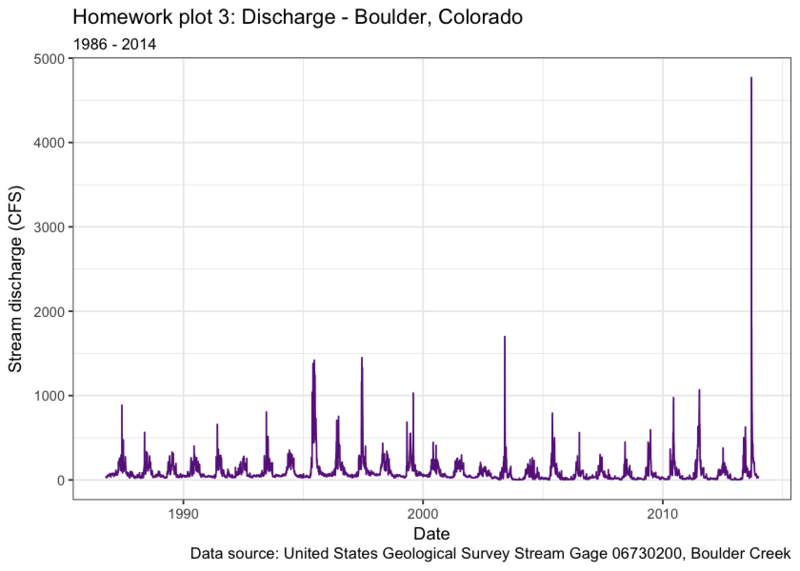 PLOT 3: a plot of stream discharge from 1986 to 2013 using ggplot() function. 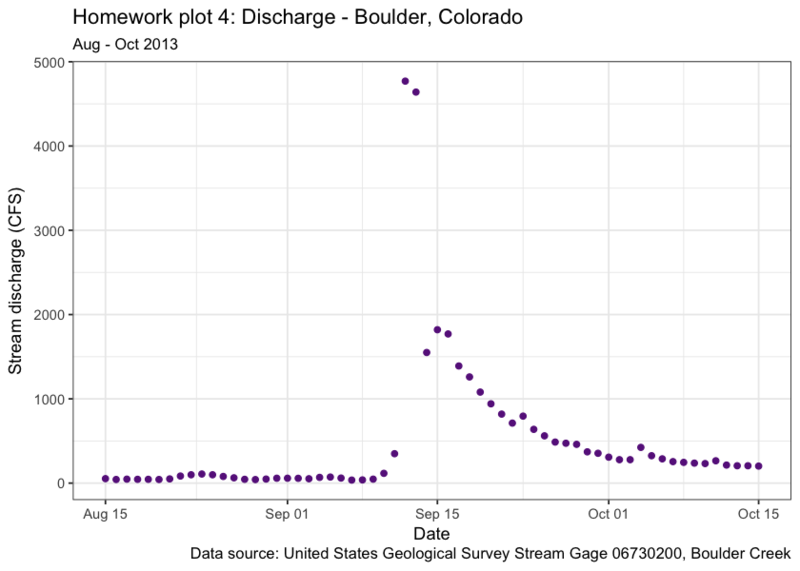 PLOT 4: a plot that shows stream discharge SUBSETTED from Aug 15 - Oct 15 2013 using the ggplot() function. A figure caption that describes the contents of the plot. X and Y axis labels that include appropriate units. A carefully composed title that describes the contents of the plot. Below each plot, describe and interpret what the plot shows. Describe how the data demonstrate an impact and / or a driver of the 2013 flood event. Label each plot clearly. This includes a title, x and y axis labels. Write clean code. This includes comments that document / describe the steps you take in your code and clean syntax following Hadley Wickham’s style guide. Convert date fields as appropriate. Clean no data values as appropriate. Show all of your code in the output .html file. Subset the data temporally: Jan 1 2013 - Oct 15 2013. Summarize the data: plot DAILY total (sum) precipitation. Important: be sure to set the time zone as you are dealing with dates and times which are impacted by daylight saving time. Add: tz = "America/Denver" to any statements involving time - but specifically to the line of code where you convert date / time to just a date! Use the bonus lesson to guide you through creating this plot. 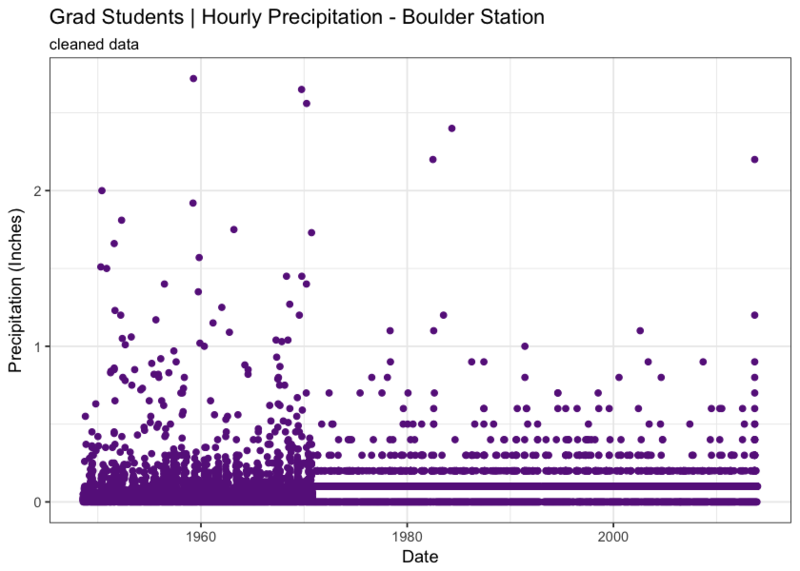 Bonus Opportunity 1 (1 point): Generate and add to your report the plot of precipitation for 1948 - 2013 described above (required for all graduate students). Identifying an anomaly or change in the data that you can clearly see when you plot it. Suggesting how to address that anomaly in R to make a more uniform looking plot. Introductory text at the top of the document is organized, clear and thoughtful. 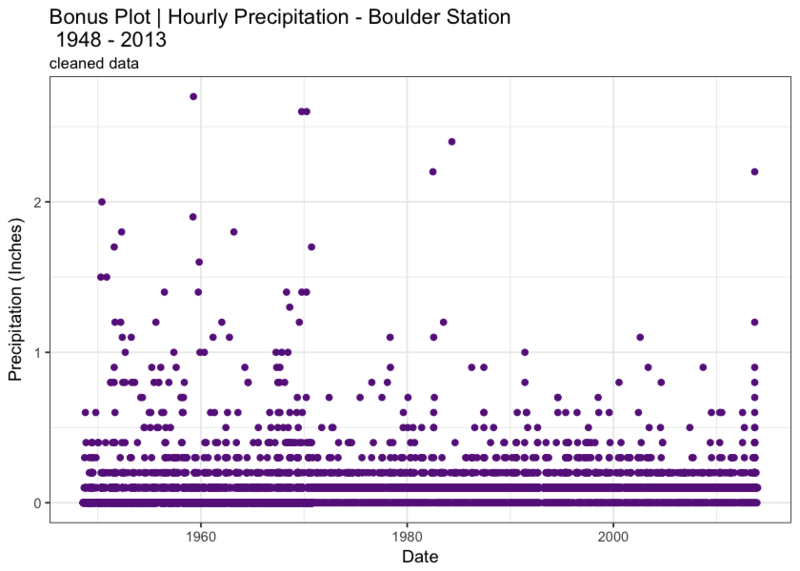 PLOT 1: a plot of precipitation from 2003 to 2013 using ggplot(). 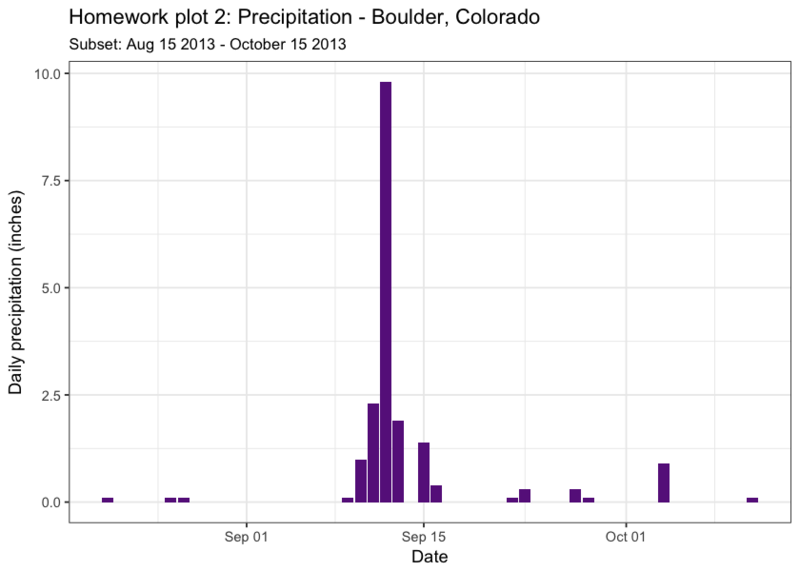 PLOT 2: a plot that shows precipitation SUBSETTED from Aug 15 - Oct 15 2013 using ggplot(). PLOT 3: a plot of stream discharge from 1986 to 2013 using ggplot(). Plots 2 and 4 should be temporally subsetted to the dates listed above. 1 point: Identify and fix the anomaly in the precipitation 805333-precip-daily-1948-2013.csv. 1 point: Create an interactive plot using dygraphs in your output html file.